The narrative of the American Dream is one of upward mobility, but there are some stories of mobility we prize above others. Who is more successful: a Mexican-American whose parents immigrated to the U.S. with less than an elementary school education, and who now works as a dental hygienist? Or a Chinese-American whose parents immigrated to the U.S. and earned Ph.D. degrees, and who now works as a doctor? But what happens if you measure success not just by where people end up — the cars in their garages, the degrees on their walls — but by taking into account where they started? In a study of Chinese-, Vietnamese-, and Mexican-Americans in Los Angeles whose parents immigrated here, sociologist Min Zhou and I came to a conclusion that flies in the face of Chua and Rubenfeld, and might even surprise the rest of us: Mexicans are L.A.’s most successful immigrant group. These figures are impressive but not surprising. Chinese immigrant parents are the most highly educated in our study. In Los Angeles, over 60 percent of Chinese immigrant fathers and over 40 percent of Chinese immigrant mothers have a bachelor’s degree or higher. At what seems to be the other end of the spectrum, the children of Mexican immigrants had the lowest levels of educational attainment of any of the groups in our study. Only 86 percent graduated from high school — compared to 100 percent of Chinese-Americans and 96 percent of native-born Anglos — and only 17 percent of graduated from college. But their high school graduation rate was more than double that of their parents, only 40 percent of whom earned diplomas. And, the college graduation rate of Mexican immigrants’ children more than doubles that of their fathers (7 percent) and triples that of their mothers (5 percent). There is no question that, when we measure success as progress from generation to generation, Mexican-Americans come out ahead. 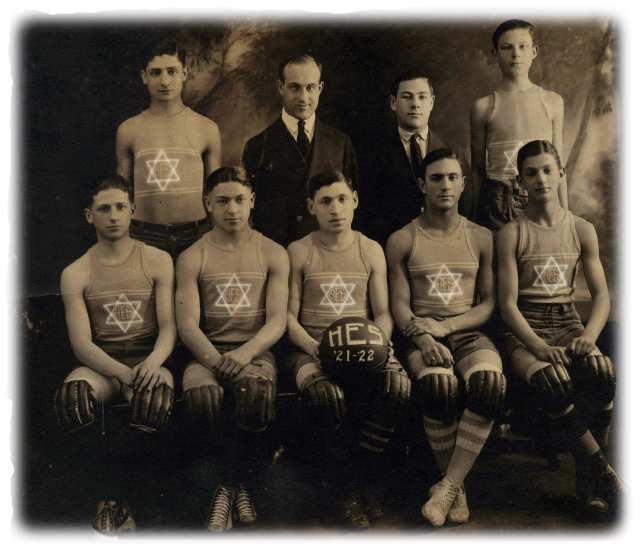 This narrow view fuels existing stereotypes that Chua and Rubenfeld play into — that some groups strive harder, have higher expectations of success, and possess a unique set of cultural traits that propels them forward. Jennifer Lee, PhD, is a sociologist at the University of California, Irvine. Her book, The Diversity Paradox, examines patterns of intermarriage and multiracial identification among Asians, Latinos, and African Americans. Cross-posted at Time and Zocalo Public Square. 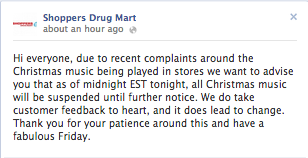 Last year a drug store chain in Canada, Shoppers Drug Mart, started playing Christmas music more than a month before the holiday. Customers complained, perhaps, Tom Megginson suggested, because it is customary in Canada to wait until after Remembrance Day on November 11 (a holiday honoring those who’ve died in wars) to start celebrating Christmas. For these commenters, the so-called War on Christmas is about much more than a competition between religious and secular forces, it’s also about the centrality of whiteness and a defense of “true” Canadianness against an influx of foreign cultures. It is worth considering whether, in general, this debate is really code for racism and anti-immigrant sentiment more generally. 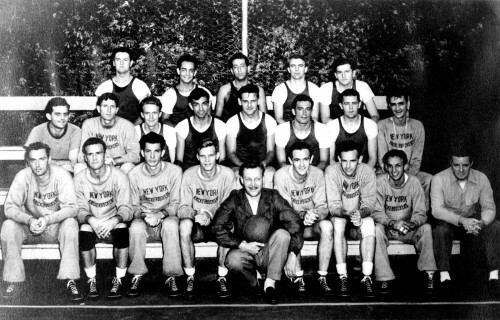 Photo by Petr Kratochvil. Cross-posted at Pacific Standard. The idea highlights two points. First, academic achievement is racialized, with Asian Americans as the reference group for academic excellence. Second, the expectations and the perceived norm for achievement are higher for Asian Americans than for other groups. The association between Asian Americans and achievement is relatively recent. Less than a century ago, Asians were described as illiterate, undesirable, and unassimilable immigrants, full of “filth and disease.” As “marginal members of the human race,” they were denied the right to naturalize, denied the right to intermarry, and were segregated in crowded ethnic enclaves. So what changed? The answer: the skills and educational profiles of post-1965 Asian immigration. According to the Pew Research Center, among recent Asian immigrants between the ages of 25 and 64, 61% have at least a bachelor’s degree — more than double the U.S. average of 28%. This is salient because children of highly-educated, middle-class parents — regardless of race/ethnicity — have a competitive edge over their poor and working-class counterparts. That a higher proportion of Asian immigrant parents hail from educated backgrounds explains, in part, why they insist on supplementing their children’s education with tutors, after-school classes, and summer school. Their investment in supplementary education helps to insure that their children will stay ahead of their peers. In addition, because tutoring services and supplementary education classes are available in Asian ethnic communities, poor and working-class Asians have access to them, which, in turn, helps them academically achieve, in spite of their disadvantaged class status. That the status of racial/ethnic groups have changed (and may likely change again) underscores that there is nothing obvious or natural about the link between race/ethnicity and achievement. 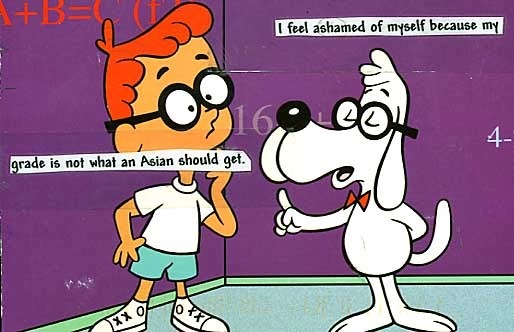 But, without understanding the high-selectivity of Asian immigrants and their means of supplementing their children’s education, one could make the specious argument that there must be something natural or essential about Asian Americans that result in high expectations and exceptional academic outcomes. To protect clean air and water and prevent the disruption of our climate, we must ensure that those who are most disenfranchised and most threatened by pollution within our borders have the voice to fight polluters and advocate for climate solutions without fear. This position nicely brings together one lefty political concern (the environment) with another (concern for undocumented immigrants). This is probably entirely genuine, but it is also very convenient from a discursive perspective. I tortured my Sociology 101 students this semester with the phrase “discursive opportunity structure,” which I introduce as “the arrangement of ideas in a society that constrain and enable communication and thought.” For example, the connection between pink and femininity is automatic in our minds whether we want it to be or not, just as the letters C-A-T conjure up a cat and we couldn’t stop it if we tried. So ideas aren’t just free floating in our collective minds, they’re built into a relationship with each other, and those relationships are part of our cognition. Sociologist Leslie King has shown how this constrains how environmentalists can talk about immigration and how anti-immigration activists can talk about the environment. 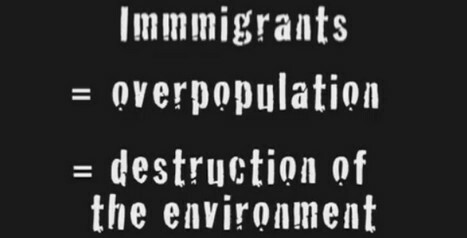 She considers “population stabilization” activists, a group that believes that immigration is harmful to the environment (paper here, two examples here). King argues that the population stabilization movement has struggled largely because the two positions they bring together — pro-environment and anti-immigration — disrupt the discursive opportunity structure. First, it’s harder for us to get our minds around the argument because it means bringing together a lefty political message and a right one. Second, insofar as our identity categories depend on the discursive opportunity structure, it requires us to fragment them. Can one be both anti-immigration (on the right) and pro-environment (on the left)? It takes cognitive work to think that through. The position announced by The Sierra Club last month, however, neatly fits into our thought patterns. Most fans of the environmental organization are on the left, so when the press release calls for a path for citizenship, it slips neatly into the political identities and cognitive structures of their audience. That likely facilitates the likelihood that their position will be both heard and influential. These data should calm the fears of people who think that high fertility rates among immigrants will harm the country by creating a “dependent” underclass or a dangerous population of non-patriots. Cross-posted at Asian-Nation and Racialicious. The decision to give up one language or to abandon a language is not usually a free decision. It’s often coerced by politics, by market forces, by the educational system in a country, by a larger, more dominant group telling them that their language is backwards and obsolete and worthless. 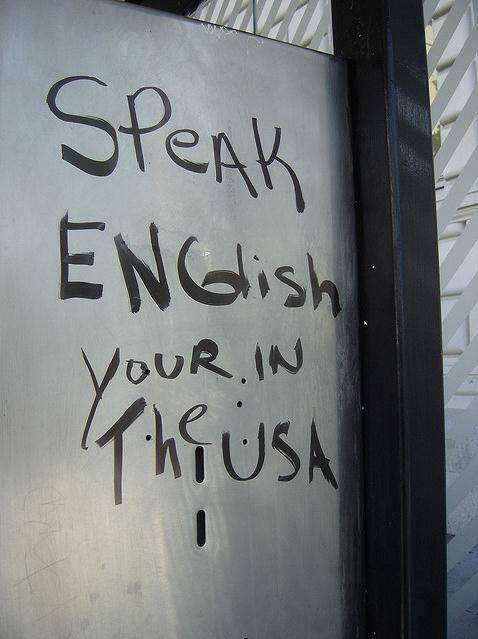 These same pressures are at work in immigrant-receiving countries like the United States, where young immigrants and children of immigrants are quickly abandoning their parents’ language in favor of English. Immigrant languages in the United States generally do not survive beyond the second generation. In his study of European immigrants, Fishman (1965) found that the first generation uses the heritage language fluently and in all domains, while the second generation only speaks it with the first generation at home and in limited outside contexts. As English is now the language with which they are most comfortable, members of the second generation tend to speak English to their children, and their children have extremely limited abilities in their heritage language, if any. Later studies (López 1996 and Portes and Schauffler 1996 among them) have shown this three-generation trend in children of Latin American and Asian immigrants, as well. The languages that most immigrants to the U.S. speak are hardly endangered. A second-generation Korean American might not speak Korean well, and will not be speaking that language to her children, but Korean is not going to disappear anytime soon — there are 66.3 million speakers (Ethnologue)! Compare that with the Chulym language of Siberia, which has less than 25. Even if they’re not endangered per se, I would argue that they are in danger. While attitudes towards non-English languages in the U.S. seem to be improving, at least among wealthier and better educated people in some more diverse cities and suburbs, the stigma of speaking a non-English language still exists. been embarrassed to speak your heritage language in front of English speakers? been reprimanded for speaking your heritage language in school? been told to “go back to [country X]” when someone overhears you speak your heritage language? I’ve heard innumerable stories about parents refusing to speak their native language to their children. Usually, the purported rationale is that they do not want the child to have language or learning difficulties, a claim that has been debunked over and over again by psychologists, linguists, and education scholars. I’m sure that these parents truly believe that speaking only English to their children will give them an edge, though the reverse is true. What I wonder is how much this decision had to do with an unfounded belief about cognition and child development, and how much it had to do with avoiding the stigma of speaking a language that marks you as foreign, and as “backwards and obsolete and worthless”? Calvin N. Ho is a graduate student in sociology at the University of California, Los Angeles studying immigration, race/ethnicity/nationalism, and Asian diasporas. You can follow him at The Plaid Bag Connection and on Twitter. 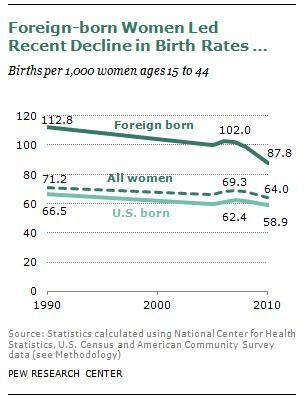 The decline was led by foreign-born women, who’s birthrate dropped 14% between 2007 and 2010, compared to a 6% drop for U.S.-born women. 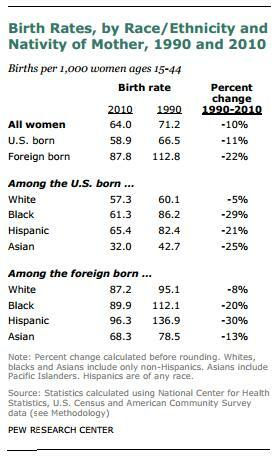 Considering the last two decades, birthrates for all racial/ethnic groups and both U.S.- and foreign-born women have been dropping, but the percent change is much larger among the foreign-born and all non-white groups. The drop in the birthrate of foreign-born women is double that of U.S.-born and the drop in the birthrate of white women is often a fraction that of women of color. It’s easy to forget that effective, reversible birth control was invented only about 50 years ago. Birth control for married couples was illegal until 1965; legalization for single people would follow a few years later. In the meantime, the second wave of feminism would give women the opportunity to enter well-paying, highly-regarded jobs, essentially giving women something rewarding to do other than/in addition to raise children. 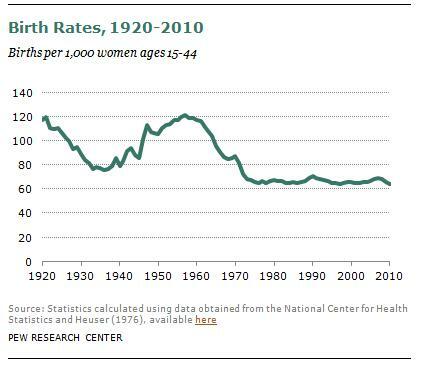 The massive drop in the birthrate during the ’60s likely reflects these changes. In addition to a drop in the number of children women are having, this data reflects a steady rise in the number of women deciding not to have children at all. The decision to eschew parenting altogether is disproportionately high among highly educated women, suggesting that the there-are-now-other-things-in-life-to-do phenomenon might be at play. Many European countries are facing less than replacement levels of fertility and scrambling to figure out what to do about it (the health of most economies in the developed world is predicated on population growth), the U.S. is likely not far behind.